Caroline Bradlee Designs > BOYS > Custom Boy's Monogrammed Name and Monkeys Or Frogs Outfit. 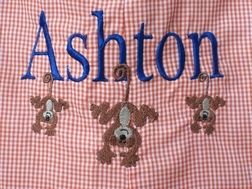 Custom Boy's Monogrammed Name and Monkeys Or Frogs Outfit. 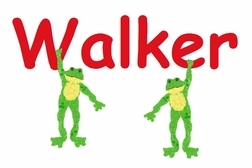 This is our cute name and hanging monkeys OR hanging frogs outfit! 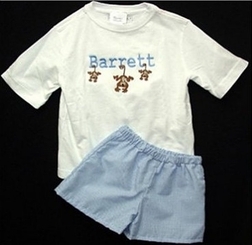 We start with a John John, shorts set, pants set or longall in your choice of color gingham, and embroider your little boy's name on the front of the John John or shirt. Then, we hang either 3 little monkeys or 2 little froggies from the name.